Republic Heritage - Latest in Political News! : The Feds’ War on . . . Buckyballs! The Feds’ War on . 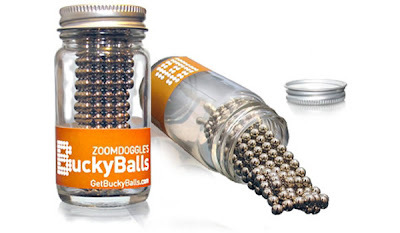 . . Buckyballs! Government paternalism is wreaking havoc on the economy. It’s come to this: In the name of protecting parents from their own lack of responsibility and common sense, the U.S. Consumer Product Safety Commission (CPSC) is waging all-out war on an innovative consumer-product company in New York. The vengeful, destructive feds won’t stop until the world is safe from tiny, magnetic Buckyballs — and until every last job created by the firm is wiped out. A dozen swallowing incidents have been linked by the CPSC to Buckyballs since 2009. Compare that to the estimated 30,000 emergency-room visits that occur every year as a result of children swallowing government-minted coins. Yet, several feckless retailers (including Brookstone, Amazon, and Urban Outfitters) under the regulatory gun have already yanked the magnets from their virtual and physical shelves despite the company’s clear warnings that Buckyballs and Buckycubes are for adults — not children. “Obviously the bureaucrats see danger everywhere, and those responsible people — like our company who have vigorously promoted safety and appropriate use of our products — gets put out of business by an unfair and arbitrary process,” Craig Zucker, founder and CEO of Maxfield and Oberton, said in a statement. Obama’s big-business pals sit on do-nothing jobs councils and host countless dog-and-pony shows touting their commitment to “Startup America.” But when a three-year-old startup that has earned $50 million in sales all on its own faces ruthless bureaucratic extinction, the government-jobs blowhards are nowhere to be found.